Lots of things going on the last couple of days: Andy Diggle did a podcast interview with Midtown Comics, a teaser image of Shadowland was posted at Newsarama, and Daredevil co-writer Antony Johnston was interviewed by Comic Book Movie Fansites. Alas, I’m not here to talk about any of that. Instead, let’s travel back to the time before the invention of slash fan fiction had ruined our perception of perfectly innocent male on male – crotch proudly on display – scenes like the one below. 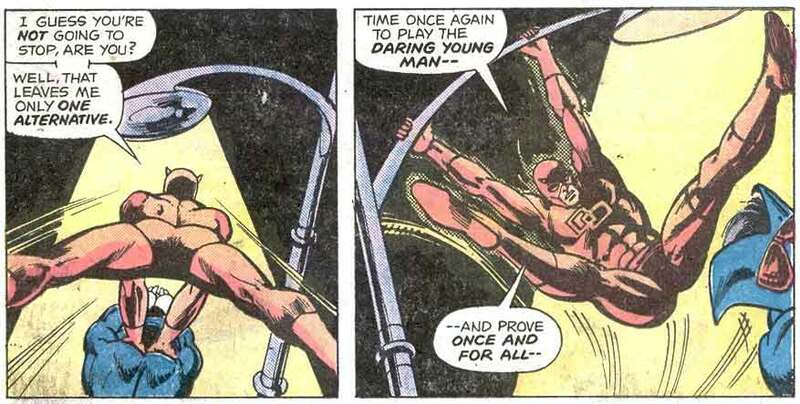 In all seriousness, though, I’ve never actually seen Daredevil spread his legs quite like this before, and from two different angles no less! If anyone is wondering what’s going on, that’s the Torpedo Daredevil appears to be mounting, in an effort to stop his misguided rampage through New York, and the scene is from Daredevil #126, written by Marv Wolfman with art by Bob Brown and Klaus Janson. Bonus points to anyone who can come up with a funny ending for Matt’s little monologue! —that the DEVIL is in your COATTAILS! – to DAMN the Torpedo and FULL SPEED AHEAD! …that going like a bullet leaves them disappointed, baby!